For the organizations for kibbutzim and moshavim, see Settlement movement (Israel). The settlement movement was a reformist social movement that began in the 1880s and peaked around the 1920s in England and the United States. Its goal was to bring the rich and the poor of society together in both physical proximity and social interconnectedness. Its main object was the establishment of "settlement houses" in poor urban areas, in which volunteer middle-class "settlement workers" would live, hoping to share knowledge and culture with, and alleviate the poverty of, their low-income neighbours. The settlement houses provided services such as daycare, education, and healthcare to improve the lives of the poor in these areas. The movement started in 1884 with the founding of Toynbee Hall in Whitechapel, in the East End of London. These houses, radically different from those later examples in America, often offered food, shelter, and basic and higher education, provided by virtue of charity on part of wealthy donors, the residents of the city, and (for education) scholars who volunteered their time. Victorian England, increasingly concerned with poverty, gave rise to the movement whereby those connected to universities settled students in slum areas to live and work alongside local people. Through their efforts settlement houses were established for education, savings, sports, and arts. Such institutions were often praised by religious representatives concerned with the lives of the poor, and criticised as normative or moralistic by radical social movements. There were basic commonalities in the movement. These institutions were more concerned with societal causes for poverty, especially the changes that came with industrialisation, rather than personal causes which their predecessors believed were the main reason for poverty. The settlement movement believed that social reform was best pursued and pushed for by private charities. The British Association of Settlements and Social Action Centres is a network of such organisations. Other early examples include Browning Hall, formed in Walworth in 1895 by Francis Herbert Stead, and Mansfield House Settlement, also in east London (see Percy Alden). Oxford House in Bethnal Green was sponsored by High Church Anglicans associated with Oxford University. There is also a global network, the International Federation of Settlements. The movement gave rise to many social policy initiatives and innovative ways of working to improve the conditions of the most excluded members of society. The Poor Man's Lawyer service came about because a barrister volunteered his time and encouraged his friends to do the same. In general, the settlement movement, and settlement houses in particular, "have been a foundation for social work practice in this country". As higher education opened up to women, young female graduates brought their energy to the settlement movement. The Women's University Settlement (now Blackfriars Settlement) was founded in 1887 "by women from Girton and Newnham Colleges at Cambridge University, Lady Margaret and Somerville Colleges at Oxford University and Bedford and Royal Holloway Universities". Between 1890 and 1910, more than 12 million European people immigrated to the United States. They came from Ireland, Russia, Italy and other European countries and provided cheap factory labor, a demand that was created with the country's expansion into the west following the Civil War. Many immigrants lived in crowded and disease-ridden tenements, worked long hours, and lived in poverty. Children often worked to help support the family. Jacob Riis wrote How the Other Half Lives about the lives of immigrants on New York City's Lower East Side to bring greater awareness of the immigrant's living conditions. The most famous settlement house in the United States is Chicago's Hull House, founded by Jane Addams and Ellen Gates Starr in 1889 after Addams visited Toynbee Hall within the previous two years. Hull House, though, was not a religious-based organization. It focused on providing education and recreational facilities for European immigrant women and children. Katharine Coman, Vida Scudder, and Katharine Lee Bates were among a group of women who founded Denison House in Boston in 1892. Lenox Hill Neighborhood House, founded in 1894, Friendly Inn Settlement House, founded in 1874, Henry Street Settlement, founded in 1893, Hiram House, founded in 1896, Houchen House in El Paso Texas, founded in 1912 and University Settlement House, founded in 1886 and the oldest in the United States, were, like Hull House, important sites for social reform. United Neighborhood Houses of New York is the federation of 38 settlement houses in New York City. These and other settlement houses inspired the establishment of settlement schools to serve isolated rural communities in Appalachia, such as the Hindman Settlement School in 1902 and the Pine Mountain Settlement School in 1913. By 1913, there were 413 settlements in 32 states. By the 1920s, there were almost 500 settlement houses in the country. The settlement house concept was continued by Dorothy Day's Catholic Worker "hospitality houses" in the 1930s. American settlement houses functioned on a philosophy of “scientific philanthropy,” a belief that instead of giving direct relief, charities should give resources to the poor so they could break out of the circle of poverty. American charity workers feared that the deeply entrenched social class system in Europe would develop in the United States. 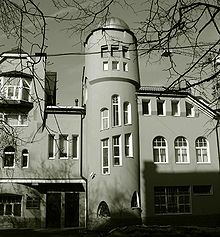 Site of the Communal Club for Working Children, a cornerstone of the Russian Settlement network. The movement also spread to late imperial Russia, as Stanislav Shatsky and Alexander Zelenko set up a network of educational and social institutions in northern Moscow in 1905, naming it "Setlement" ("Сетлемент", the English word transliterated to Russian). This network of institutions was closed down by the government in 1908, due to alleged socialist activities. Today, settlements are still community-focused organizations, providing a range of services including early education, youth guidance and crime intervention, senior programs, and specialized programs for young people who have "aged out" of the foster care system. Since they are staffed by professional employees and students, they no longer require that employees live alongside those they serve. Settlement houses influenced urban design and architecture in the 20th century. For example, James Rossant of Conklin + Rossant agreed with Robert E. Simon's social vision and consciously sought to mix economic backgrounds when drawing up the master plan for Reston, Virginia. The New Monastic movement has a similar goal and model. ^ Wade, Louise Carrol (2004). "Settlement Houses". Encyclopedia of Chicago. Chicago Historical Society. Retrieved 2009-06-22. ^ Reyes, J. M. (2008). Common space, safe place: Lived experiences of former settlement house participants from the West Town and Humboldt Park neighborhoods of Chicago Dissertation Abstract International, 69(5), 1682A. (UMI No. AAI3314871) Retrieved July 13, 2009, from Dissertations and Theses Database. ^ "Our History". www.blackfriars-settlement.org.uk. Retrieved 12 July 2018. ^ Michael Friedman; Brett Friedman (1 January 2006). Settlement Houses: Improving the Social Welfare of America's Immigrants. Rosen Classroom. pp. 4–7. ISBN 978-1-4042-0859-9. ^ a b Victor J. Danilov (26 September 2013). "Social Activists". Famous Americans: A Directory of Museums, Historic Sites, and Memorials. Scarecrow Press. pp. 356–357. ISBN 978-0-8108-9186-9. ^ Husock, H. (1993). "Bringing back the settlement house". Public Welfare, 51(4). ^ "Reston". JamesRossant.com. Retrieved 30 December 2010. Wikisource has the text of the 1911 Encyclopædia Britannica article Social Settlements.